NOTE: If you have a TA or a co-teacher, they will upload your students into the platform for you as long as you provide them with a student roster spreadsheet that includes students' first names, last names and school email addresses (see below for more information on how to create this spreadsheet). When you're ready to add students to your class (which can be before or after you've added a course), navigate to your class dashboard by clicking the class name in the left sidebar, then on the right side of the screen where it says STUDENTS, click + Add Student. 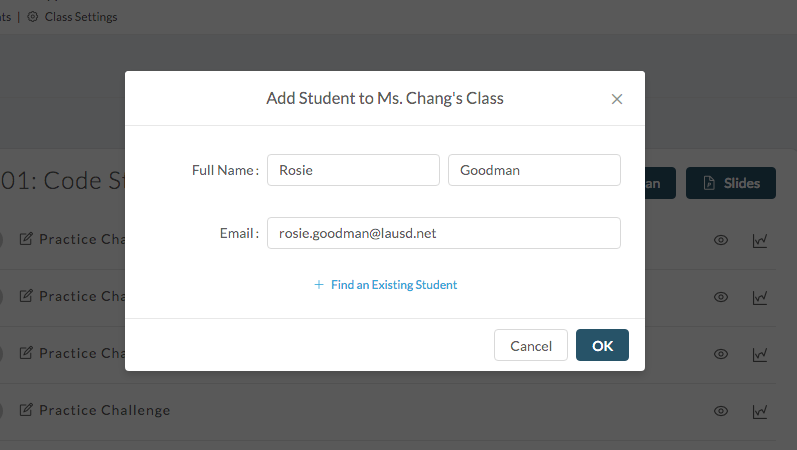 Add an existing student in your school via the dropdown menu (mainly used for transferring a student from one class to another, and won't be covered in this tutorial). Upload a spreadsheet of your class roster. 1. Before you upload a spreadsheet, you'll need to make sure it's in the proper format and that you've downloaded it as a CSV file. There should be three columns in the spreadsheet (the order doesn't matter): First Name, Last Name and Email. See below for an example of what the spreadsheet might look like. Once you've filled out the spreadsheet, click "File > Download as > Comma-separated values (.csv, current sheet)." 2. Navigate back to the "Add a Student" screen for your class, and click Upload Spreadsheet. 3. A file browser window will appear. Select the CSV file that you created (it will most likely be in your "Downloads" folder). NOTE: This step may look slightly different for you depending on your tech setup. 4. The platform will read the top row of your spreadsheet and ask you to match up the columns that contain students' first names, last names and finally their emails. Make sure you're selecting the appropriate column to match each question when prompted (see example image below). 5. Upon clicking Done, you'll see a screen with a list of all your new students. Make sure to delete any rows that don't actually contain student names (e.g. column labels). You can also click into any item to edit it if necessary. Once you're satisfied, you can click Add (#) Students. 6. All of your students will now appear in the right sidebar. 1. From the "Add a Student" screen, click Create New Student. 2. Fill in the students' information, including their first name, last name and school email address. Then click OK. The student has now been added to your class.